Being described as a literary painter used to be something of a slur. A story needed to be puzzled out or things extraneous to the painting known to make it worth looking at; formal properties were lacking. We live in less, or at least differently, tyrannous critical times. This has mostly been to the good. No longer shy of art’s literary qualities, curators have drawn people into paintings the aesthetic pleasures of which might at first prove elusive. The connoisseur is dead, long live the cultural historian! 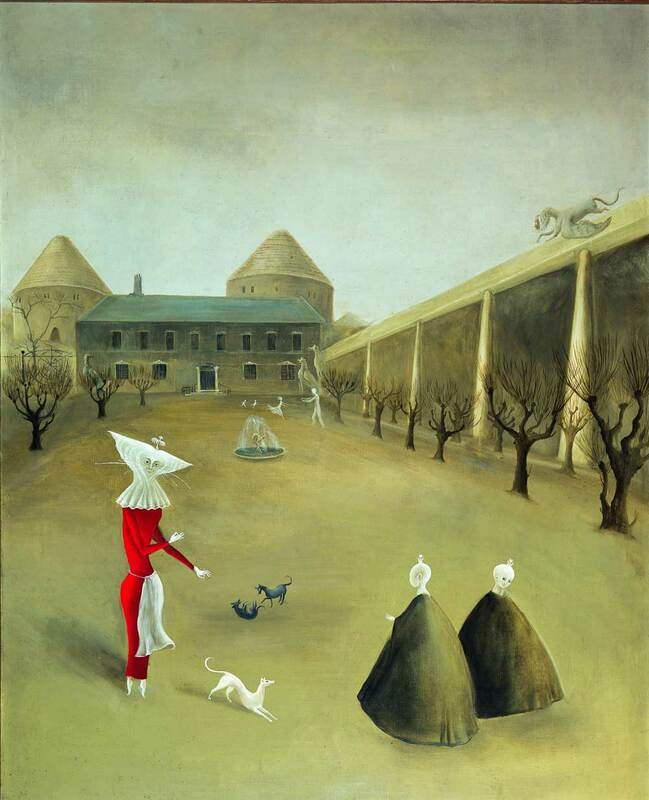 Such critical shifts came to mind at the Irish Museum of Modern Art’s new exhibition, a retrospective on the surrealist Leonora Carrington. She led a long and eventful life. As a young woman in the 1930s, she escaped the stiff Lancashire county set for the bohemian high jinks of Paris, becoming Max Ernst’s partner. A traumatic war saw her end up in a Spanish asylum, before she managed to travel to Mexico, where she achieved considerable fame. Her work draws on a heady mix of influences. Her mother was Irish and the exhibition makes much of an interest in Celtic myth and folklore. References recur to other myths, literary works (by Dante, John Donne, Jonathan Swift and others) and painters – Renaissance Italian most obviously. Part of the story the exhibition also tries to tell is of her satirical subversion of a patriarchal culture; while her work, like that of many female artists, has only latterly been given due attention. For all the stories that the 50 paintings and over 30 works in other media gathered might be made to tell or rest among, they brought out something of my inner formalist: forget the patter, what about the paintings as images (not to mention the tapestries, sculptures, watercolours, drawings, prints and lithographs)? In her best work, the visual certainly holds its own. Probably Carrington’s most famous work, The Giantess (the Guardian of the Egg) (c. 1947) is replete with possible references – the essayists in the catalogue have a field day. The suggestiveness of its giant female figure, dwarfing land and sea, however, also surely lies in its combination of compositional strength and decorative delicacy. It formally works. In Ulu’s Pants (c. 1950) the curious semi-recognisable creatures (a recurring trope) in the foreground benefit from the balance of their arrangement and the spatial depth created by the blue eerie labyrinth and red sky behind. Yet her work is wildly uneven. Often Carrington’s paintings in particular seem to struggle to organise themselves as objects of visual attention. In her more crowded canvases, it turns out that being a kind of surrealist Hieronymus Bosch is aesthetically hard to pull off. More restrictive media, like tapestry or graphite, often seem to bring out a stronger sense of design. Perhaps paint offered too many options? Any sense of stylistic development, though, is hard to grasp, due to the exhibition’s curation. This manages the unfortunate trick of being fussy yet lackadaisical. Works are grouped around sometimes rather intricate themes (‘hunting-satire’), which are then only revealed in eye-wateringly small notices. And pointing to a list of myths is not quite the same as illuminating the possible use of a myth. In more strictly literary terms, Carrington was a writer too, winning praise from André Breton among others. This is something the exhibition emphasises but in a way that again frustrates rather than enlightens. In the opening room, notebooks and printed texts are meaninglessly crowded in one big case, unexplained and hard to examine – showing and not telling when it should, for once, be the other way round. 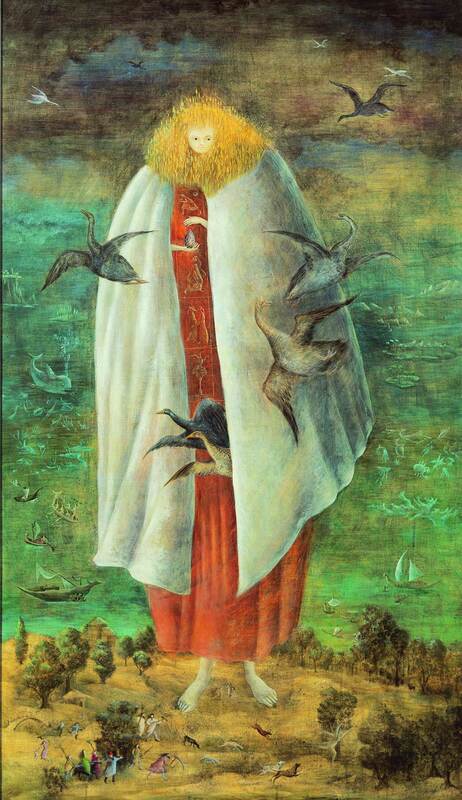 ‘Leonora Carrington: The Celtic Surrealist’ is at the Irish Museum of Modern Art (IMMA) until 26 January 2014. There’s never been a better time to subscribe to Apollo magazine. Start your subscription now with a month free plus an Apollo tote bag. Carrington’s work has a sense of joy. Visually pleasing with colour and composition on the surface with the underlying mix of a Celtic mythical influence and that of the Renaissance.